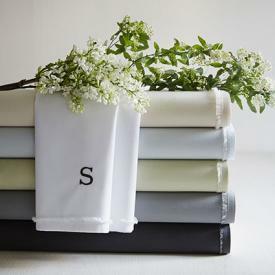 Choosing organic sheets has many potential health and environmental benefits. The New York Times indicates bed sheets that are not organic can be riddled with dangerous chemicals, and according to EcoSites.org, bedding made from artificial materials often contains chemicals linked to numerous health problems. Fortunately, there are plenty of affordable options for organic bedding available today. Organic sheet sets can cost upwards of $200 or more, so checking out inexpensive sets from different retail stores can aide your economic and eco-friendly shopping endeavors. Department stores like Target pride themselves on providing affordable products, although some of their products are higher quality than others. Rodale's Organic Life recommends Target's Threshold Organic sheets based on their GOTS certification, fun colors and patterns, and affordable price range. A typical sheet set will cost less than 60 dollars. Crimmins notes that many organic sheets do not have high thread counts, which makes the Target Threshold Organic sheets a major find. The thread count of sheets is a major factor in the texture of the sheets, and most people aren't willing to sacrifice softness when they purchase organic sheets. Target's Threshold Organic sheets have attracted many positive customer reviews, and a relatively high average customer rating based on hundred of reviews. The organic sheets from the Threshold brand should meet the expectations of many customers. Customers should be able to find organic sheets at Target for full, king, queen, twin, and California king-sized beds. The Threshold Organic sheets are available in ten different colors and their prints vary, which can make the selection feel more extensive. Situations where these sheets are out of stock online or in the stores are not uncommon, but Target has many locations and plenty of reasons to refill their supply of sheets. Apartment Therapy (AT) recommends sheets from the The Company Store (TCS) for individuals who want quality products for less than 100 dollars. TCS's organic cotton meets the Global Organic Textile Standard certification requirements while still having a pleasingly soft texture. The thread count of their sheets ranges from 300 to 399. Since Crimmins considers even a thread count of 325 to be impressive for a set of organic sheets, the organic sheets available at TCS are particularly high in quality for the price. TCS has a reasonably broad selection of organic bedding, particularly when it comes to its wide range of sizes. Customers can get organic bedding for a euro, queen, twin, standard, full, California king, full/queen, extra large twin, or king-sized bed. There are seven different sheet colors available, including green, brown, and ivory. Crimmins also recommends West Elm (WE) organic bedsheets specifically for people that are looking for relatively inexpensive sheets. The price range for a WE sheet set is 79 to 119 dollars. WE offers 100 percent organic cotton sheets and received certification from the Global Organic Textiles Standard. The reviews of WE organic duvet covers on Amazon were universally positive, with customers praising the texture and appearance of the covers. WE has a relatively narrow selection of organic bedding, and the fact that it does not have organic bedding categorized on its website makes the sheets somewhat more challenging to find in that context. However, they still have sheet sets that vary in thread count, size, color, and style. The sheet sets are available in black, white, gray, light purple, and cream. People with king, full, California king, twin, and queen-sized beds will be able to find appropriate sheet sets. 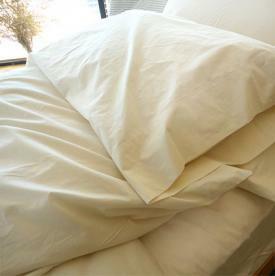 EcoSites.org recommends the CozyPure store as an outlet for purchasing organic bedsheets. 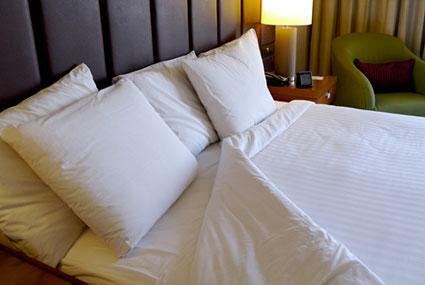 The sheet sets can cost as little as 48 dollars, which is miniscule compared to the price of many sheet sets. CozyPure uses 100 percent GOTS-Certified Organic Cotton in its products. CozyPure has generated lots of praise from customers, who have complimented everything from the customer service of CozyPure to the comfort of the bedsheets themselves. The website is designed well and customers should be able to find what they need with ease. CozyPure has a limited selection of sheet sets. 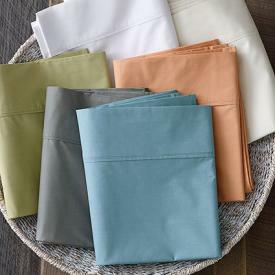 An individual sheet set or bedroom product may only be available in one color, which limits the selection further. However, cream-colored sheets have been consistently popular for a long time, and some customers will prioritize price over selection. Customers can still purchase king, queen, twin, California king, full, and extra large twin-sized sheets, so they will not have to compromise on size. Customers who opt for discount organic sheet sets will not have to give up the qualities in bedsheets that they consider important. They can still have sheets with pleasing textures and colors that adequately fit their beds.